The housing market is carving out a bottom and renters are slowly starting to purchase homes again. 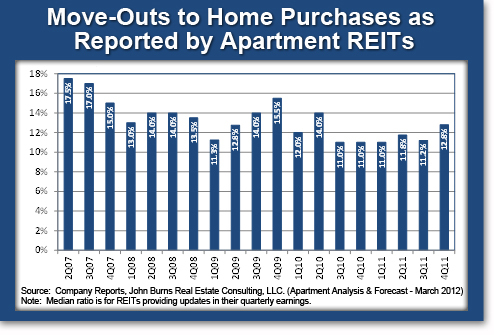 As shown below, the percentage of apartment REIT renters moving out to purchase a home rose last quarter. 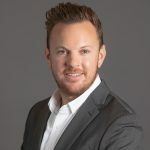 That said, the move-out to purchase ratio varies significantly across the country, peaking at 21% in cheaper markets such as Phoenix, but still low at 5% to 6% in more expensive markets such as New York and Southern California. First-time home buyers (the bulk of which are under 35 years of age) now account for roughly 30% of home sales, down from as high as 50% in 2009. While purchasing a home is simply out of the question for most young adults, many are still capable of renting on their own, and millions of others have reverted to shacking up with mom and dad. Dubbed the “Boomerang generation” for their tendency to leave the nest during good times and move right back in during tough times, the Pew Research Center recently found that 41% of adults ages 25 to 29 currently live with or have moved back in with their parents temporarily because of the economy. 17% of 30 to 34 year olds also fall into this category. However, the Pew Research Center’s sample size was just 800. Our 2012 Consumer Insights survey of over 20K respondents provides more potent evidence of a multi-generational household boom. In fact, over 70% of our survey respondents are considering the possibility of accommodating extended family in their next home purchase and 19% said that they certainly will – with children 18 years of age and older the primary beneficiary of parental largesse. 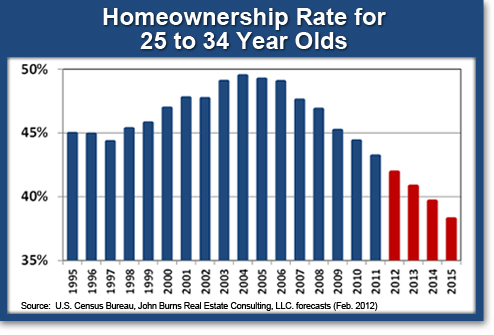 Due to a combination of factors (e.g., lingering mortgage distress, lackluster economic growth, and stringent lending), we expect the homeownership rate for 25 to 34 year olds to continue falling through 2015. 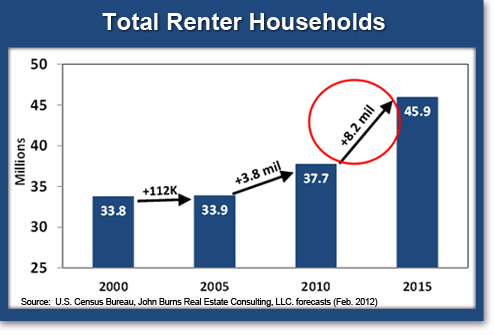 Subsequently, we anticipate that over 8 million renter households will be added from 2010 to 2015, more than double the amount of renters added from 2000 to 2010. In addition to the three aforementioned factors, we believe there is a fundamental paradigm shift that is contributing to the decline in homeownership for 25 to 34 year olds – namely the acceptance and abundance of debt that will make them unable to qualify for a mortgage. The piling on of debt and a significant increase in monthly expenses in comparison to their parents (think iPhone, premium cable, gym memberships, Starbucks, etc. ), will permanently make it more difficult for the Boomerang generation to purchase a home throughout their lifetime. This, along with the fact that inflation adjusted wages have actually declined for college graduates over the last decade, adds further credence to our growth outlook for renter households. As more consumer debt is embraced, debt-to-income ratios get strained, and student loans are perhaps the most glaring example of those under 35 becoming burdened by debt. Federal student loans outstanding have shot up 360% since the beginning of the recession, rising from $98 billion to $453 billion in just four years. Over the same four year time span, higher education enrollment is estimated to grow by just 14%. To make matters worse, interest rates for federally-subsidized Stafford loans will double from 3.4% to 6.8% this July if Congress fails to intervene on an expiring 2007 law. Declining home prices have made it more difficult for parents to tap into home equity to help their grown children out. Thus, it’s likely that the New York Fed’s 27% student loan delinquency rate estimate will rise. 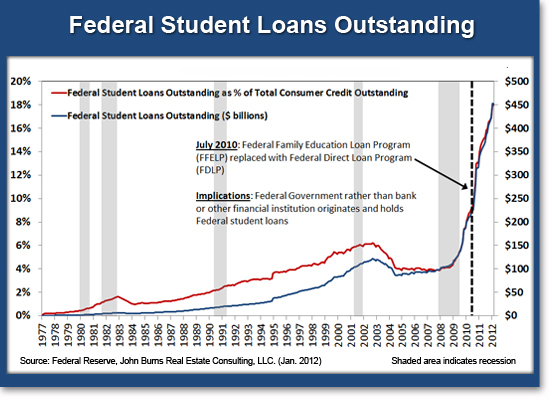 The chart below (which is frankly one of the scariest we’ve ever put together), reveals that Federal student loans now equate to roughly 18% of all consumer credit outstanding. These eye popping numbers don’t even factor in outstanding private student loans, as data availability for this portion of the debt market is quite opaque. However, if the Consumer Financial Protection Bureau’s recent estimate is correct, and total outstanding student loans exceed $1 trillion, then there’s $550 billion more in private student loans outstanding. At $1 trillion, outstanding student loans equate to roughly 6.5% of U.S. GDP. To put this in perspective, U.S. student indebtedness now exceeds the GDP for all but 15 of the 184 countries tracked by the IMF. Unfettered access to credit fuels the fire for irrational price appreciation, a lesson we all recently learned with the housing market collapse – and college degrees are not immune to this basic rule of thumb. Clearly, tuition costs are rising at a pace that is unsustainable for students, which will have a generational impact on these individuals propensity to own homes. Our 20K person consumer research survey, which can be summarized using a local sample size, also shed additional light on this, and is helping builders and developers redesign their communities and floor plans to meet current market demand. Federal mortgage policy, including the risks that loan originators perceive, will play a huge role in determining the eventual homeownership of Gen Y.